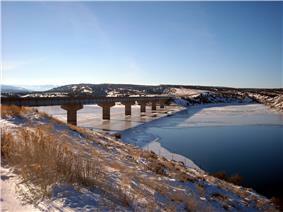 Freedom Bridge over Starvation Reservoir on U.S. Route 40 in Duchesne County, Utah. The Uintah Basin, also spelled Uinta Basin, is a physiographic section of the larger Colorado Plateaus province, which in turn is part of the larger Intermontane Plateaus physiographic division. It is also a geologic structural basin in eastern Utah, east of the Wasatch Mountains and south of the Uinta Mountains. The Uintah Basin is fed by creeks and rivers flowing south from the Uinta Mountains. Many of the principal rivers (Strawberry River, Currant Creek, Rock Creek, Lake Fork River, and Uinta River) flow into the Duchesne River which feeds the Green River—a tributary of the Colorado River. The Uinta Mountains forms the northern border of the Uintah Basin. They contain the highest point in Utah, Kings Peak, with a summit 13,528 feet above sea level. The climate of the Uintah Basin is semi-arid, with occasionally severe winter cold. Blue Mountain, east of Jensen, Utah. Father Escalante's expedition visited the Uintah Basin in September 1776. The Northern Ute Indian Reservation was established in 1861 by presidential decree. The United States opened the reservation for homesteading by non-Native Americans in 1905. During the early decades of the twentieth century, both Native and non-Native irrigation systems were constructed—the Uinta Indian Irrigation Project, the Moon Lake Project, and the Central Utah Project. The Uinta Mountains form the northern boundary of the Uintah Basin. The largest community in the Utah part of the Uintah Basin is Vernal. According to the U.S. Census, the community's population in 2010 was 9,089. 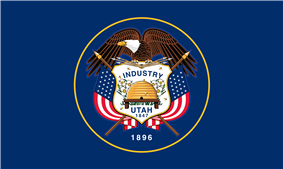 Other communities in the Utah part of the region include Duchesne, Roosevelt, Altamont, Tabiona, and a number of small unincorporated communities. The Uintah Basin is also the location of the Uintah and Ouray Indian Reservation, home to the Ute Tribe of the Uinta and Ouray Agency (also known as the Northern Ute Tribe). The Ute Tribe is the source of Utah's state name. Local attractions include Raven Ridge and Fantasy Canyon. The local economy, once based on agriculture and mining, has diversified, and energy extraction and tourism are now major industries as well. In order to move oil out of the region, a new railroad is proposed to be constructed into the basin. In addition, Utah State University operates extension campuses at Vernal and Roosevelt, expanding educational opportunities in a previously underserved region of Utah. 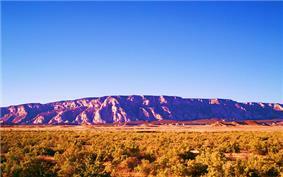 The Uintah Basin is the most northerly section of the Colorado Plateau sections. The basin is 5,000 to 10,000 ft above sea level and corresponding to this depression is a broad east-west strip of higher plateau that rises sharply above the denuded country to the south. On the south side of the plateau the descent of 3,000 ft, to the general level of eastern Utah on the south, is made in two steps. The first is the Desolation Canyon. The Colorado River crosses the eastern portion of this section, cutting off an area of some 40 miles in diameter in which are preserved fragments of a lofty lava cap forming Grand Mesa and Battlement Mesa. 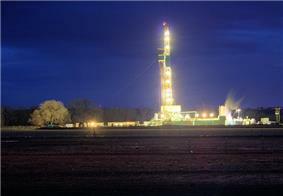 The Uintah Basin forms a geologic structural basin, and is the source of commercial oil and gas production. ^ Leighty, Dr. Robert D. (2001). "Colorado Plateau Physiographic Province". Contract Report. Defense Advanced Research Projects Agency (DOD) Information Sciences Office. Retrieved 2007-12-25. "Uinta Basin". Geographic Names Information System. United States Geological Survey. Retrieved 2012-12-24.